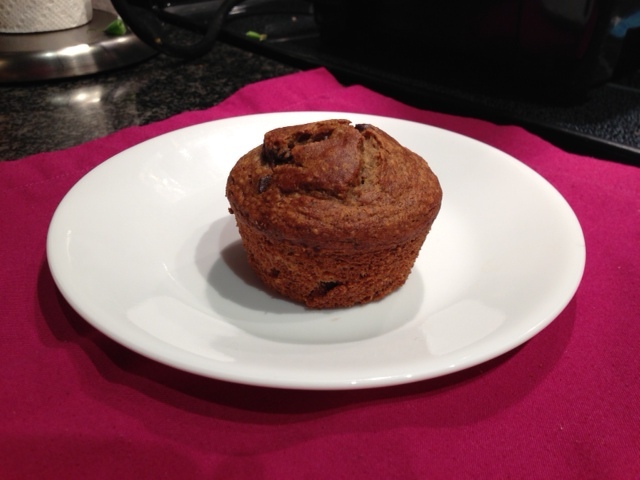 I love baking healthy muffins, because they are such a quick and portable breakfast or snack. I’ve been experimenting with gluten free versions for a while now. Some are a real flop, and only I end up eating them. Others are decent, and Benjamin and I will eat them. I know that they are good when Dylan and Jake say that they like them. My latest version of a banana muffin was a hit with everyone in the family. I hope you try this recipe. Let me know what you think! Mix baking soda, baking powder, salt, cinnamon, flours, and chocolate chips in a large bowl. Pour in wet mixture. Mix until combined. Grease muffin tins well with grapeseed oil. Pour in mixture to fill cups. This recipe makes 12 muffins. Bake until golden brown, approximately 20 to 25 minutes. Categories: Baking, Gluten free, Recipe | Tags: Baking, Gluten free, Muffin, Recipe, vitamix | Permalink. As much as I love chocolate, I’ve always had a place in my heart for lemon desserts. There is something so refreshing about a lemon sorbet, a lemon merengue pie or a lemon square. Unfortunately, a lot of these desserts are on my do-not-eat list since they generally contain copious amounts of white sugar and butter and gluten! 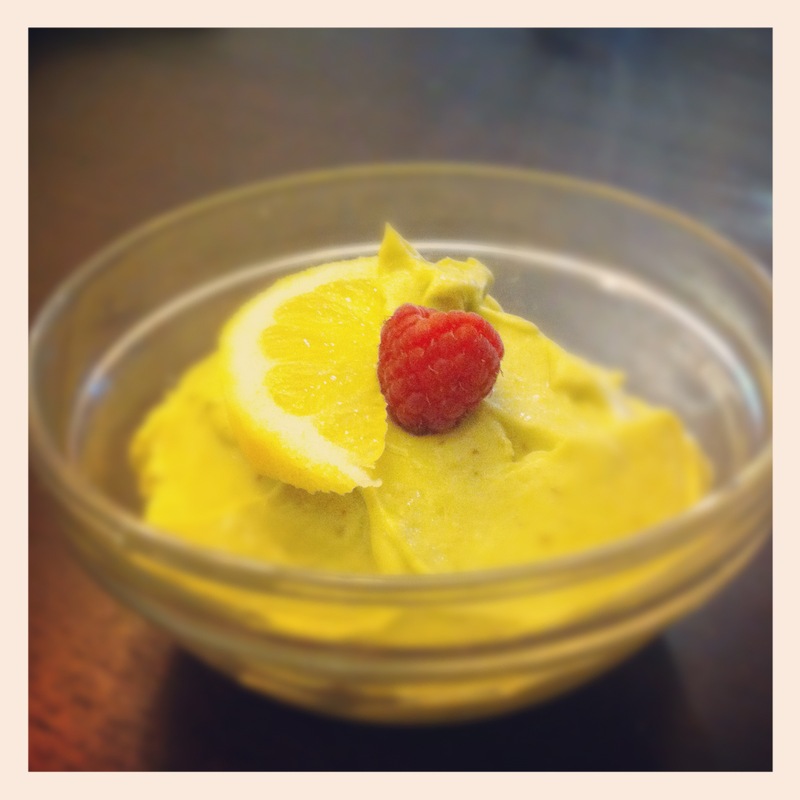 A couple of nights ago I decided I was in the mood for a lemony treat and whipped up something that turned out amazing. It was rich, creamy, tart and also healthy. I made a lemon pudding and its base was avocado. Avocados truly are super foods – they are a good source of vitamin K, dietary fiber, potassium, folic acid, vitamin B6, vitamin C, and copper. They can help lower your cholesterol and your blood pressure. Plus – they taste delicious! I am quite sad that we are out of both avocados and lemons because I’d really like to eat this right now! Must buy some tomorrow. 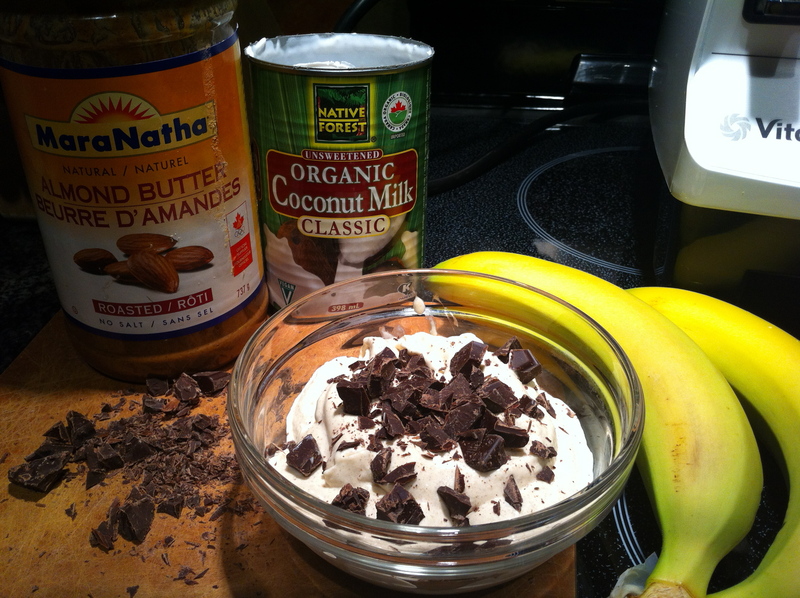 Makes 1 large serving, or two medium sized servings. Categories: Cooking, Gluten free, Vegan | Tags: Avocado, Cooking, Gluten free, vitamix | Permalink. I love smoothies. I really do. I tend to have one every day for breakfast. They are an easy way to get in tons of fruits and veggies first thing in the morning and when I add in all my extras like protein powder, almond milk, chia seeds and more, they are very filling and keep me going til lunch. OK – so back to juice making – I really want a juicer and it is on the wish list of things I want for my kitchen. Until then, my trusty Vitamix is my juicer! 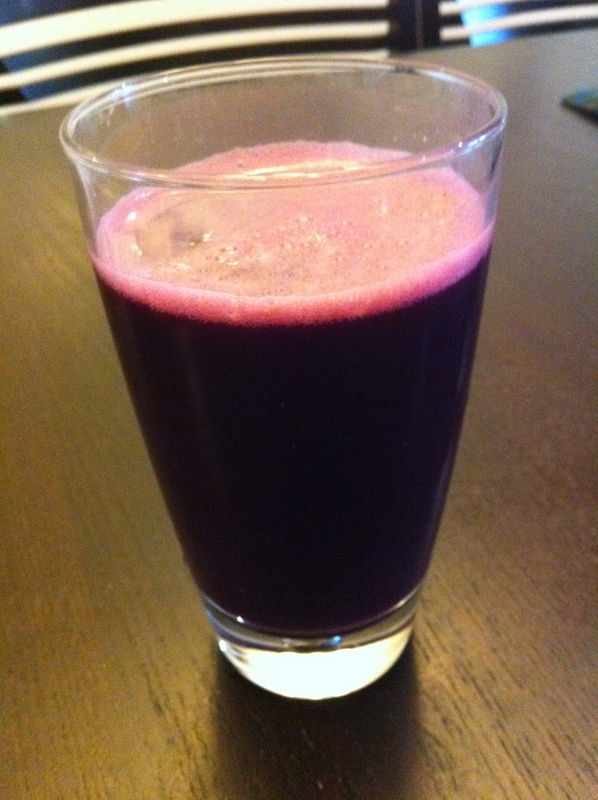 When making juice, it is best to use a whole bunch of veggies and just enough fruit to make it palatable. When you make juice, you remove the fibre from the fruits and veggies. This is no big deal – I know I get tons of fibre throughout my day. However, when you eat fruit, the fibre in them helps to balance out the sugar, which prevents spikes in your blood sugar level. That’s why I just put a bit of fruit in my juices, and mainly concentrate on the veggies. You can never get enough veggies in your diet! 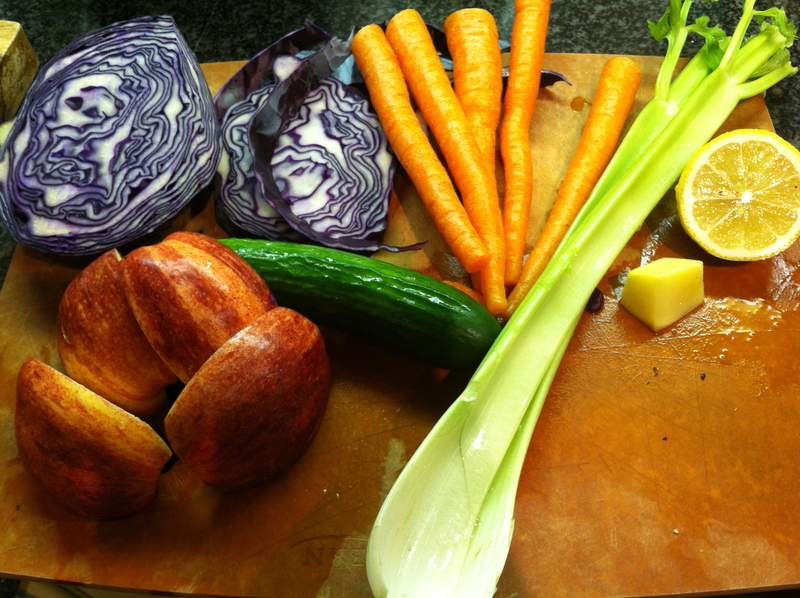 Here’s a picture of the veggies and fruit I used in today’s juice – a big chunk of cabbage, 5 carrots, 2 stalks of celery, 1 apple, 1 small cucumber, half a lemon and a chunk of ginger. I began the process by putting a bit of water in the blender to get things going – perhaps a scant 1/4 cup. Then I added the celery and cucumber and blended til smooth. Then I added each item and blended. It’s easier to add things slowly then trying to cram everything in there at once. The whole process probably took me 15 minutes. 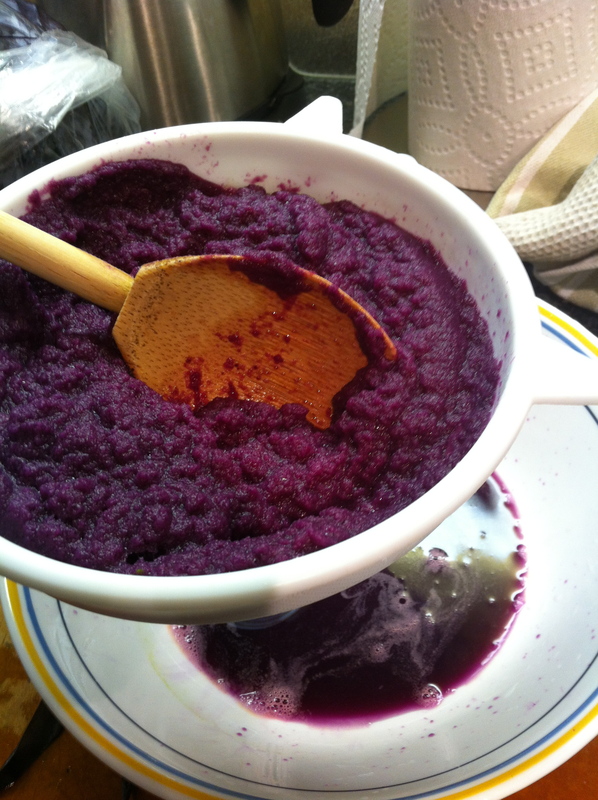 The most time consuming part is pressing down the mixture with a spoon to get all the juice out. I managed to do this with my toddler grabbing on to my leg and my 4 year old talking my head off about Lego. A bonus with using the Vitamix for juicing is that the clean up is super quick. (I’ve heard the conventional juicers are a pain to clean). I thought the final product was delicious. I might have added a bit more ginger, but otherwise the combination of veggies with the apple was perfect. I should add that my 4 year old wouldn’t drink it, but my 1 year old loved it. Perhaps my four year old would have liked it with less ginger and another apple! Have you ever used your blender to make juice? Also, do you have any favorite juice combinations? 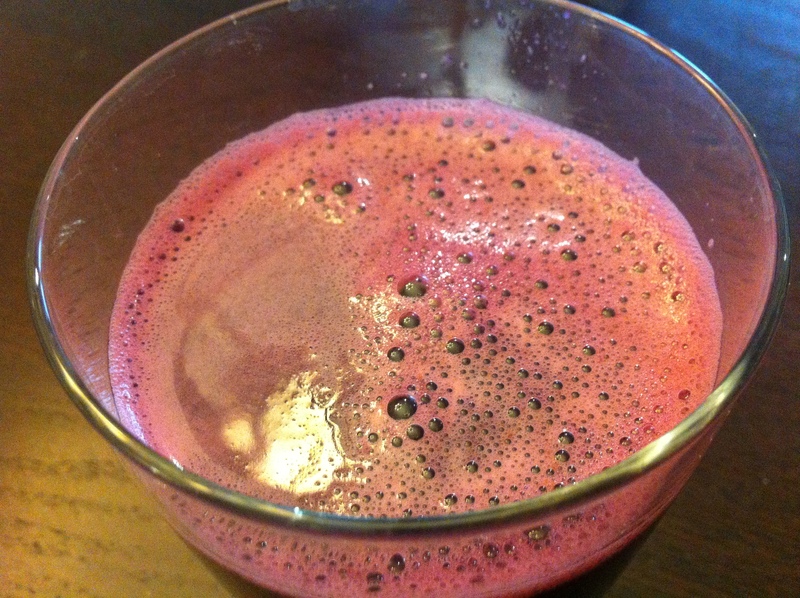 Categories: Juice, Uncategorized, Vegan | Tags: Food, Juice, smoothie, vegan, vitamix | Permalink.